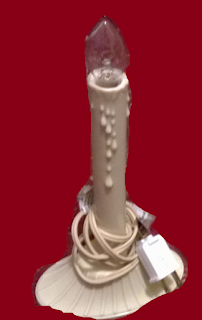 In this post I'll show you how to make some DIY fancy household stuff! Let's Start! This is a slightly more "grown up" tutorial than usual, I know. But hear me out! This will be fun! Desired decourations like lace,stickers, etc. 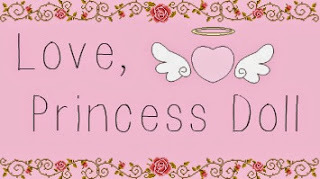 Every Princess wants a perfect night of beauty sleep so she can show her best face to the public. One way to accomplish a good night's rest is a sleeping mask. 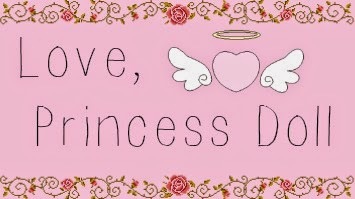 But a Princess can't be caught at any moment of her life being anything but cute, right? So let's make this sleeping mask more Princess worthy! Start with a basic Sleeping mask. Not sure where I got mine, but I found that you can buy cheap ones at the dollar store. Or you could draft a pattern and make your own! While the hot glue gun is heating, lay out how you want the decourations to be on the mask. Are you more of the Gothic type Princess, who'd enjoy reading Poe stories by the light of a candle- but don't want the fire risk? Never fear! Let's make a fake candle light for the best Gothic ambiance! Start with a fake candle! If you don't want a long candle like this, you can buy little fake tea lights from the dollar store. Hot glue a gem, and done! Are you tired of tending to your hime cut with a boring, plain comb? Let's Princess-ify that boring comb into a royal treasure! Start with a boring comb. Not sure where I got mine, I just had it since like forever. Decourate to your heart's content! I started by adding a tiny bow to the handle, then added a handmade charm to the bow. But it wasn't shimmery enough, so I added little whale charms along the side! More modern Princesses love listening to their favourite music on iPods and computers- But why settle for boring, unexpressive headphones? 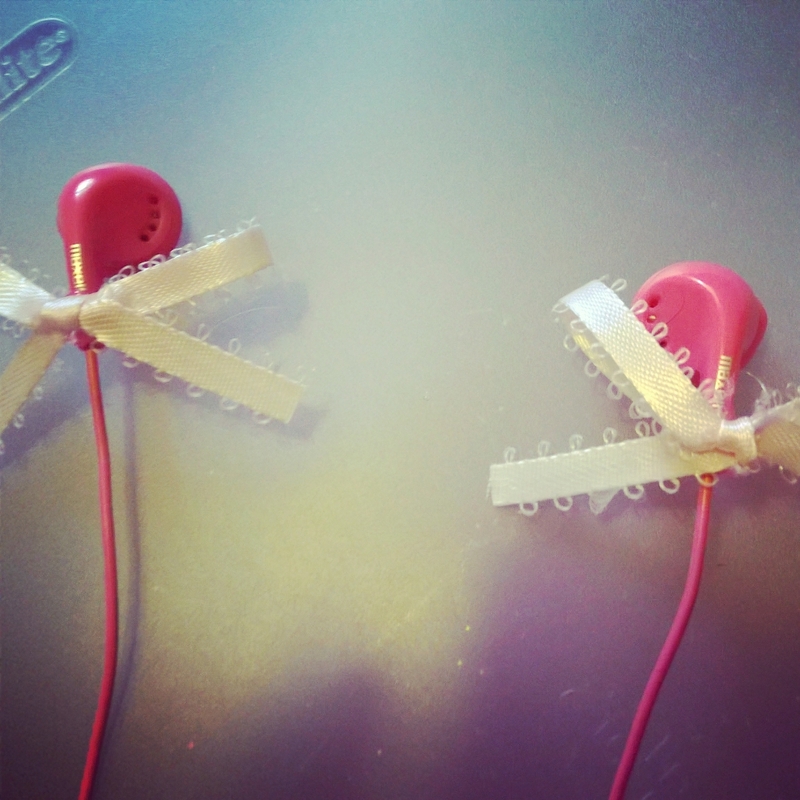 Let's make more royal headphones for your Princessy listening! I got mine at walmart for like $5. Add whatever decourations you want. For mine, I was worried about overloading them with hot glue. So I only put two little bows. 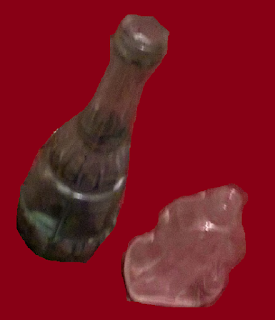 A nice fantasy element to add to any Princess's home decour is potion bottles. But say you don't know any witches, where are you to get such things? Let's make some! Start with plain decourative bottles. You can buy these relatively cheap from places like marshalls, tj-max, or even the thrift store. 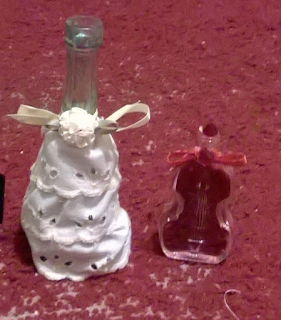 For mine, I hot glued the lace to the green bottle and simply followed the lines already on the bottle, and tied a bow around the neck and hot glued a rosette on. For the violin bottle, I pushed scraps of red stretch velvet into the bottle, and glued a red bead inside the neck like a stopper. Then I tied a bow around the neck and hot glued the same kind of bead to the bow.